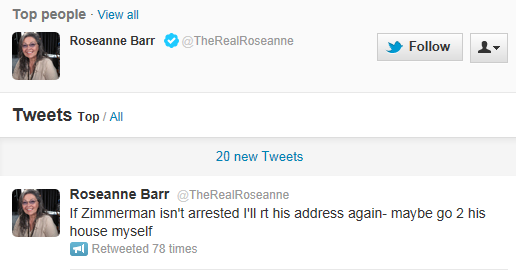 LEFTY Roseanne Barr Tweets Address of Zimmerman’s Parents, Then Says She Will Go to Their House … What Was Her Intent? Roseann Barr TWEETED the address of George Zimmerman’s parents and then sent another TWEET stating that she would go to their home. To do what exactly Roseanne? What is her intent, to stir up violence and fan the flames of the already out of control mob mentality? As stated by Weasel Zippers, Roseanne Barr appears to be picking up where Spike Lee left off. Are these people only going to be happy if someone gets hurt? Just curious, what happens if a crazed lunatic sees the TWEET, goes to the address and kills someone, will Roseanne be held liable? There come a point and time where people need to act in a responsible manner. However, Tweeting one’s address and then tweeting that you are going to go to their home, what exactly is Roseanne’s intent? To many that is interpreted as a threat. Just curious, what part about TWITTER rules does Roseanne Barr and the other vigilante loons not get? As reported at The Smoking Gun … The TWITTER Vigilante Crew continues. Who is really going to be shocked when some one is hurt or killed because of this vigilantism?